Hello couscous! This was the first recipe I'd ever made with couscous and still continues to be my favorite. Okay, you're probably wondering about the title. Tyler and I read the book Eat to Live and have decided to take the 6 week challenge to see how we feel. Is anyone else out there enjoying this as much as we are? We are doing this to feel healthier, although it can be used as a weight loss tool as well. I love a good food challenge! Does anyone else get bored with the same recipes all the time? It's exciting to look at recipes with a different goal in mind. This goal: is it healthy, do I make it from scratch, can I take out any added oil, how many vegetables can I put in it, what beans can I add, can I make it meat-less, can I take out added sugar, does it have whole wheat in it, brown rice instead of white, and can I add flax meal to it? These are the questions that I try to answer in my cooking right now. Mix all ingredients and toss together. Bottom line...you can still have tons of flavor and enjoy eating. For lunches around here, we take the dish (like this one) and eat it on top of spinach. It's been fun to make these new salads for Tyler to take to work. I was just thinking ab out this salad after you mentioned it yesterday! It sounds so good. Do you think it would work made with quinoa instead of couscous? also, you could totally add beans to this! I have been meaning to read that book. I saw Dr. Furman on this documentary called, 'Fat, Sick, and Nearly Dead' and I liked what he had to say. You can watch it on Netflix and I thought it was really interesting. Looks delicious! I will have to try it out. Eat to Live changed my life! Good luck with the six weeks! 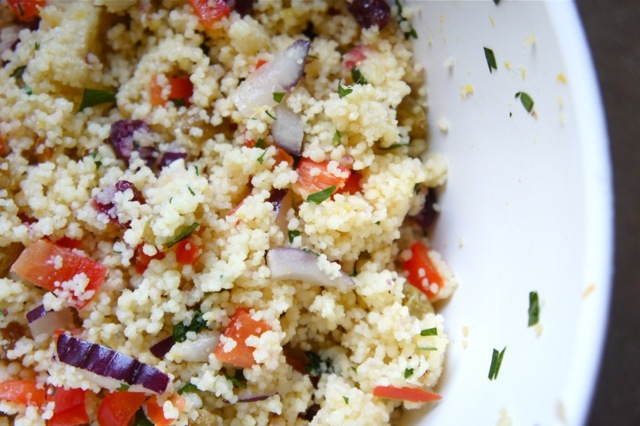 You might want to try this salad with cracked whole wheat (blugar) since couscous is very similar to eating pasta. I've been following Dr. Fuhrman's advice for 8.5 years and love eating this way! Yeah! Use quinoa. It's BOMB! I have a southwest quinoa recipe I can send that I just love. Okay, now I'm going to add that book to my list on reserve at the library :) I read Skinny B**ch, which was borrowed from a girl at church (LOL) and although provocative and full of filler words, was right to the point, kinda gross at some of those points, but pretty convincing. Now if I only knew how scientific some of THEIR claims are... but seeing the main themes in all kinds of books leads a person to believe there's a lot of truth to them! Davis changed me as an eater for life. Hello vegetables. Hello spices. Hello REAL food!! Haha. Oh, and hello Asia. Thanks, guys! And yes to the quinoa. (And yes to the beans as well...good thinking!) I will use that next time. I just had a friend over who makes a similar type recipe with quinoa. I will make it and give you the recipe, too. Thanks Isa for the Dr. Fuhrman shout-out! I already feel really good. And Jess, I haven't heard of that book, but I do want to read The Omnivore's Dilemma. Have you read that one? I read Dr. Fuhrman's book about ten and a half weeks ago and started eating to live right away. Not only have I lost 55 pound, but I am now off all medications and healthier than I have ever been! I completely recommend the nutritarian way of life! Keep it up! My first 2 weeks of the six week plan were very difficult due to all my addictions. But after that it got easier everyday and now it's just my way of life!